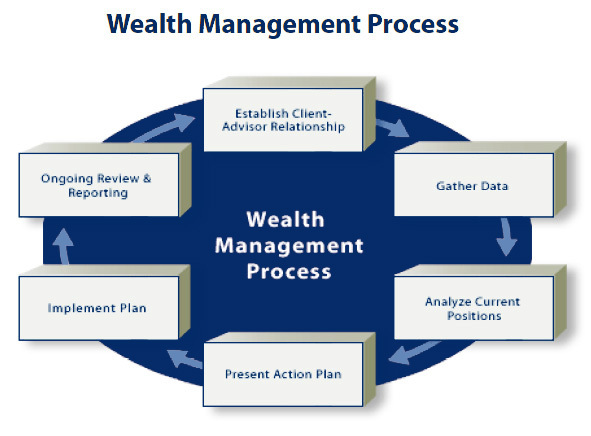 Intelligent investors often ask, “What is your wealth management process?” The following pages aim to provide the answer. There is a system to our practice, and, when managing our clients’ assets, we adhere to it. Below, you will find a brief overview of our six-step process. The goal here is to get to know you. We will ask you for relevant financial data, assess your risk tolerance, and determine your financial goals and needs. All future decisions in the wealth management process will stem from this information. We will identify your principal needs and work with you to prioritize both short- and long-term goals. In an “observations meeting,” we will assess your current accounts and policies, looking closely for gaps or inconsistencies. Depending on your situation, we will draft a financial plan that may include an Investment Policy Statement, a thorough retirement income plan, or a detailed action plan. At this stage, we will make the investment decisions on a product level: Which mutual funds should you buy? Which insurance policy is best for you? What sort of annuity fits best with your situation? The final step in the wealth management process involves the ongoing monitoring of your portfolio. As time goes on, we will ensure that your assets remain diversified and that your objectives stay on track. Diversification does not assure a profit or protect against a loss in declining markets.